The events of Easter 1916 appear to have had little or no immediate impact on the young composer Ina Boyle (1891-1967). Living in the secluded environment of her family home, Bushey Park in Enniskerry, Co. Wicklow (where her father was Church of Ireland curate), Boyle was more closely affected by the Great War. Several young men of the parish had already lost their lives, and Boyle’s own family was directly touched by the conflict when in September 1915 her cousin Adelaide Jephson’s husband, Captain Grenville Fortescue of the 11th Battalion, was killed in action in France at the age of twenty-eight. Mourn not for these, who had no perishing! Hang high their swords in churches greatly spanned! They live anew, immortal by their choice. And the moon swims from the storm-wrack overhead. Soldiers at Peace (full score), TCD MS 4055 f. 2r. 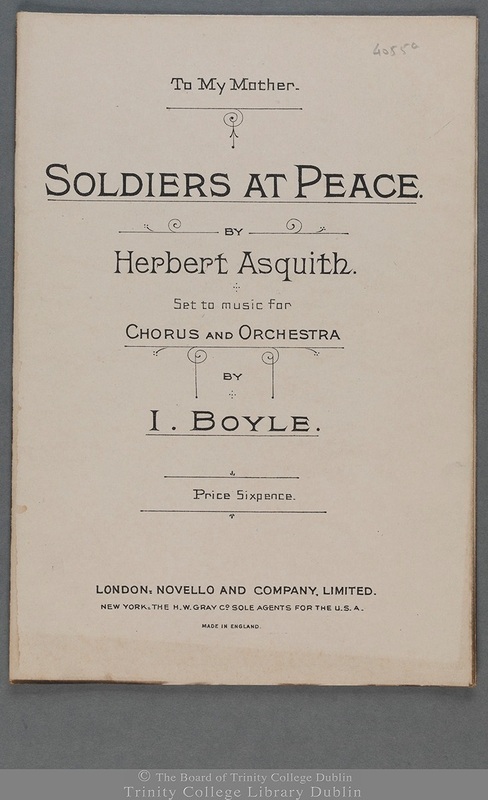 Soldiers at Peace (vocal score), TCD MS 4055a. Musical compositions memoranda, TCD MS 4172 f. 4r. Boyle entered the work in the Carnegie Trust’s first competition for the publication of new musical compositions, held in 1917. While it did not receive an award, the piece was commended by the judges and placed on a list of “works of special merit”. 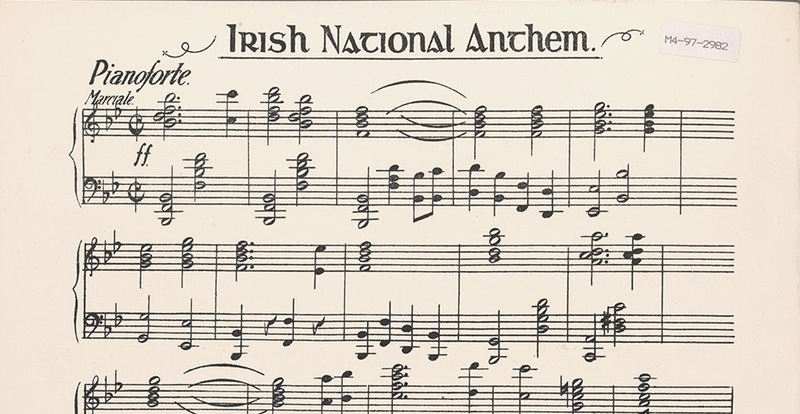 The following year Boyle paid £11.7.0 to have a vocal score published by Novello, and on 6 February 1920 ‘Soldiers at peace’ received its first (and only) performance, given by Bray Choral Society at Woodbrooke, Bray, Co. Wicklow. A full orchestra was not available: a band of amateur string players was assembled (bolstered by a few professionals), and the wind parts were played on the organ by J. Turner Huggard. Boyle described the event as “the happiest night of my life”, and the Irish Times reported that the work was enthusiastically received. 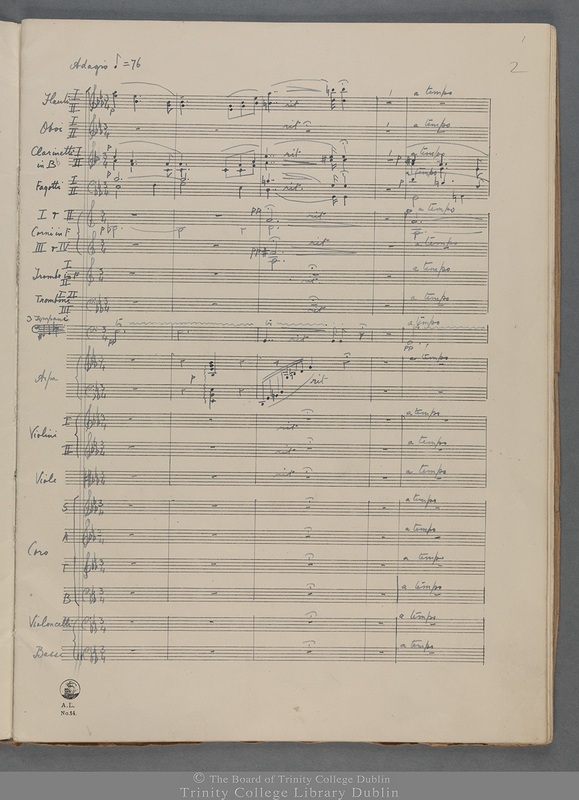 The manuscript full score, printed vocal score and orchestral parts of ‘Soldiers at Peace’ (TCD MS 4055) have been digitised and are available on Digital Collections. 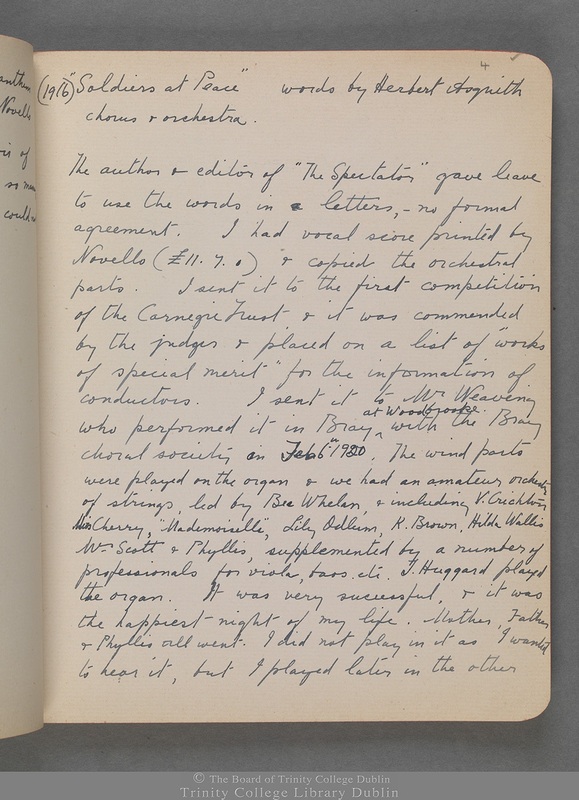 Ina Boyle’s annotated register of compositions (TCD MS 4172) is also available. I am grateful to Dr Ita Beausang for generously sharing some of her unpublished research on Ina Boyle and her family.